Beskrivelse Condition undercarriage: 85%. 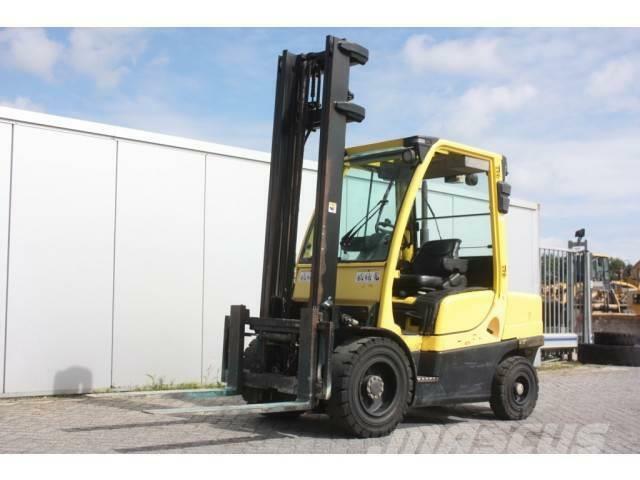 Hyster H3.5FT forklift, E-rops cab with heater, 4 cylinder Yanmar 4TNE98-NMH engine with 66HP (48,5kW), max. lifting capacity 3.500Kgs, Duramatch transmission, duplex mast length 4.30Mtr, fork length 1.14Mtr, side shift, front and rear work lights, beacon, 250-15 front tyres and 6.50-10 rear tyres 85% remaining, CE marked. Forklift is in very good condition. LH cab door is available (not shown on pictures).